You need to give yourself some time and space to rest and renew. You need some self-love and to learn about self-care and how to implement this into your busy life. You need to be surrounded by other inspiring and authentic Tasmanian women. You need to be at the 2018 Body Mind and Business event. We've had three years of amazing events for BMB and 2018 is going to be more inspiration, more self-care and a focus on nurturing your physical, mental, emotional and spiritual health. Join us on May 12th at Alceme Urban Retreat in the city centre of Hobart. 2 x yoga classes suitable for all levels of experience - including if you have none! - (value $40), (at least!) 2 x inspirational guest speakers (value $160), 2 x workshops (value $200), an incredible sound bath from Dave Reynolds of Harmonic Sound Bath (value $150) an amazing catered lunch (you asked for it, so we've brought it to you! Value $20), access to amazing stallholders - all Tasmanian women handcrafting their magic into the world and coming together as women in a space that is entirely our own for the day (value = priceless!). The Body Mind and Business Event Series brings together Tasmanian women for inspiring and transformational events. We rest, renew, learn, grow and support each other through workshops, guest speakers and small business stalls from local Tasmanian female business owners. 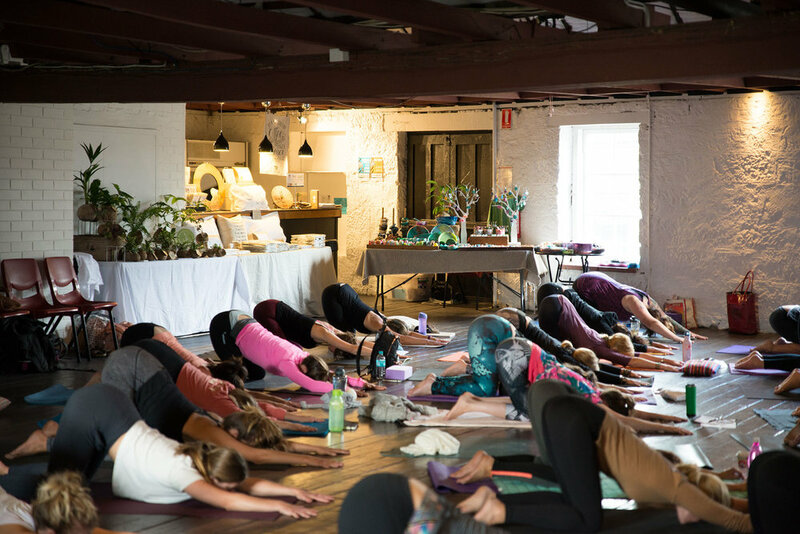 As a guest you will learn from your co-hosts, speakers and guests, take part in workshops from Kate and co-host Lauren Morey from Yoga Space, be bathed in relaxation from meditation and yoga sessions and stretch and move with Lauren's powerful yoga sessions. You'll walk out of that room not only with a beautiful gift from us to you but a totally changed perspective on your life and an imperative to create change for yourself. You will move, you will stretch, you will listen, you will learn and you will ‘do’ and you will come away inspired, rejuvenated and ready to take on your life with gusto. How many of us go through life putting one foot in front of the other just to get through the day? I love the Body Mind and Business workshops in Hobart and am consistently blown away by the group of strong, educated and passionate women that Kate and her co-host Lauren bring together for the day. Change starts with you, and change is inevitable after walking away from this event. I left feeling uplifted and driven to nail down some goals. The level of dedication and enthusiasm that Kate and Lauren demonstrate in their organisation of the event and in hosting workshops and speaking is a testament to their passion for bringing like-minded women together in a nurturing, supportive and healthy community. I can’t wait to attend again. As a stallholder you will be surrounded by up to 60 women who want to learn who you are, how you create your products and what you provide to the world. Please contact me by clicking the button below if you would like to submit an EOI to be a stallholder at the next event. Places are limited. Join the Renewal Revolution to stay updated on Body, Mind and Business and other events. Please note that there are limited spaces for stalls at the event and not all expressions of interest can be guaranteed a place. Stallholders will be notified of their EOI by a date within one month of the event (if not earlier). Now that you have filled out an EOI for the 2018 BMB event, could you please email kate@katecashman.com with a photo attachment of something you are happy to gift as a lucky door prize, and any logos or images we can use to promote your business. EOI forms that do not have accompanying emails to this effect will not be considered. This is in part, to help us streamline the application process. We can’t wait to see you at our next Body Mind and Business event.